Hundreds of Oakland educators, parents, and community members gathered Saturday in Temescal to flex their power, share information, and organize ahead of a potential February teachers’ strike. 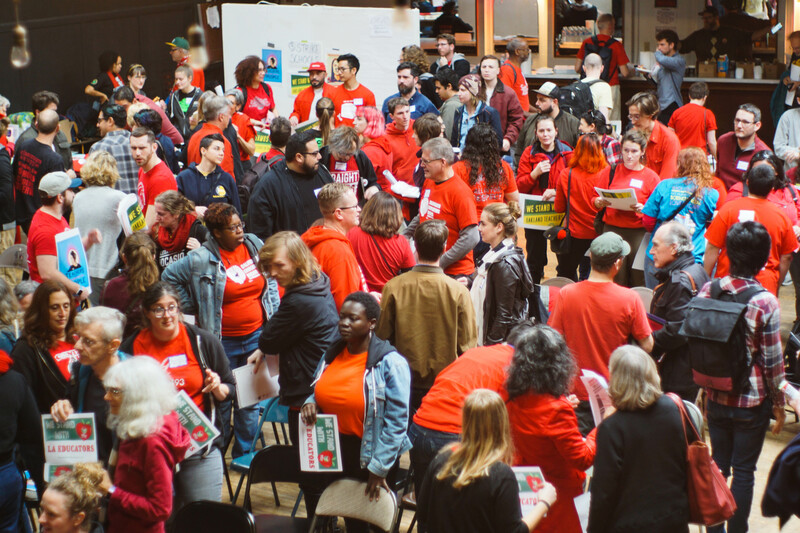 The meeting represented the contract campaign’s first large-scale gathering of the Oakland educators who make up the Oakland Education Association (OEA), California Educators Rising, Wildcat Underground, and supporters from East Bay DSA and other community groups. Deirdre Snyder, treasurer of the OEA, framed the event as a collaborative effort to reverse a trend of school closures and privatization. Break-out groups worked together to plan for different aspects of the potential strike, including solidarity actions, picket support, strike schools, as well as developing solidarity and working relationships with other activists, educators, and union members, a number of whom voiced emphatic support for the strike. Teachers have been working without a contract for months, and the district has made only insultingly low offers that don’t address teachers’ main demands: higher pay and better services for students. OUSD teachers have the second lowest pay in Alameda County, and that’s within a city with the fourth highest cost of living in the US. This dynamic has created its own crisis, as one out of five OUSD teachers leave the district each year, primarily due to the high cost of living and the low pay, destabilizing students’ learning environments. On top of that, the district has a critical shortage of non-teaching staff like nurses and counselors. Staff without medical credentials are often forced to take a medical caregiving role for their students. In response, the union’s demands in their contract campaign include a 12 percent raise in pay over three years, reductions in class size and caseloads, greater support for community schools, more support staff, and greater oversight of charter schools. This salary cut was justified by an ongoing budget crisis, one Snyder said is the result of mismanagement by Oakland Unified School District officials and deliberate attempts by state officials to privatize the city’s schools. Last year, a departing superintendent was found to have increased the number of administrators making more than $200,000 from four to 26, and left a budget deficit of about $30 million. However, OUSD’s financial crisis is caused by far more than individual mismanagement; it’s the result of a concerted effort by billionaires out to destabilize, destroy, and privatize public education in order to reduce their own tax burden. Between 2003 and 2009, state officials took control of Oakland schools, at the behest of politicians with ties to Eli Broad, a billionaire who founded a pro-charter school administration academy later found to have secret plans to transform 50 percent of LA public schools into charter schools. The first of three state-appointed administrators in Oakland—who were graduates of Broad’s Broad Academy—shuttered 14 public schools while opening 13 charter schools, draining the district’s coffers and reducing per student spending. Snyder said this has created a negative feedback loop—as funding goes to charter schools, public schools lose money, and the ensuing financial loss is used to justify closing more public schools and opening more charter schools. Inevitably, this leads to poor teaching conditions, with educators in attendance at the event complaining of chair shortages, rat and roach infestations, and students disserved by underpaid and overworked teachers quitting mid-semester. What’s more, these schools don’t appear to offer tangible improvements for students or the community at large. Charter schools don’t appear to boost math test scores, reading test scores, high school graduation rates or college enrollment, with some studies suggesting that charter schools perform worse on average. Educators and community members in attendance pointed towards the irony that, unlike last year’s wildcat teacher strikes in red Republican states—Arizona and West Virginia—the strike they were preparing for is set a solidly blue, Democratic Party-dominated state. To many, this lays bare the financial incentives and special interests that have largely fueled interest in Oakland-based charter schools—especially in extremely well-funded campaigns for local education offices. Despite the ongoing budget woes, well-funded political opposition, and a local charter school network that already enrolls 30 percent of Oakland students, educators in attendance were hopeful about the future of public education in California. The courage, creativity, and ingenuity on display at the meeting shows that teachers, parents, students, and people across the diverse working class of Oakland are ready to stand with UTLA in bringing the red state rebellion to blue California in 2019.